Discover the man who transformed the modern art world. Transmitting Andy Warhol brings together more than 100 artworks from one of the most influential, controversial and notorious artists of the twentieth century. The exhibition provides a new insight into the breadth of Warhol’s artistic processes, his philosophies, as well as the social, political and aesthetic implications of his ground-breaking practice. In his desire to make art public, Warhol’s practice spanned the worlds of art, media, music, fashion and celebrity. Exhibition highlights include the Marilyn Diptych 1962, Dance Diagram 1962 and Do-it-Yourself 1962 paintings. These will be shown alongside Warhol’s television commercials, fashion illustrations for Vogue and Harper's Bazaar, concert posters, his TV show and a dazzling display of his trailblazing celebrity magazine Interview. The exhibition will also include the much loved works Three Brillo Soap Pad Boxes 1964/68 and Campbell’s Soup I 1968. The exhibition includes a spectacular presentation of the travelling multi-media spectacle The Exploding Plastic Inevitable (EPI), Warhol’s famed ‘total art’ environment. Used as a framework for a series of performances by the Velvet Underground and Nico, EPI will bring the atmosphere of 1960s New York to the Liverpool Waterfront. Transmitting Andy Warhol is exhibited alongside Gretchen Bender and the The Serving Library to form Tate Liverpool’s autumn/winter season - Making Things Public. Across the gallery, you are invited to explore how artists from different generations have responded to and experimented with the pervasive influence of mass and broadcast media. Whether you’re visiting Liverpool to do your Christmas shopping, take in the Liverpool Christmas lights or enjoy Liverpool’s Christmas markets, Tate Liverpool is the perfect addition to your trip. We have a wide selection of unique, art inspired Christmas gifts in the Tate Liverpool shop and a delicious selection of comforting treats in the Tate Liverpool Café; perfect for a winter’s day. Be sure to try one of our fabulous Marilyn cupcakes, also available gluten free. Members private view of Tate Liverpool's Autumn/Winter exhibition Transmitting Andy Warhol on 6 November 2014. Members guided tour of Transmitting Andy Warhol at Tate Liverpool on Thursday 6 November 2014. Join Tate Liverpool for some fun free winter workshops inspired by the iconic pop art of Andy Warhol. Members weekend at Tate Liverpool, December 2014. Join our Art Handling technicians for a behind the scenes tour. Members December Weekend 2014 at Tate Liverpool. 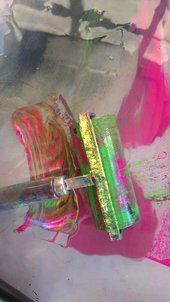 Join Fran Disley for a Warhol printmaking workshop inspired by Transmitting Andy Warhol. Join In The Frame for a drop in printmaking workshop inspired by Tate Liverpool's exhibition Transmitting Andy Warhol. Warhol After Dark: Last chance to see!